The weekend seemed like a perfect one to go for an extended hike using two cars. We chose to complete about a third of the Elora Cataract Trail running between Hillsburgh and Cataract, a distance of about 18 kilometres. The east end of the trail can be found at Mississauga Road although the former right of way continues east from there. Based on the trail map we determined that we should leave one car at The Forks Of The Credit Provincial Park. The roadway into the park is in horrible shape and the pot-holes will threaten to rip the front end out of your car. Having braved the lane way you will find that $14.50 is the full day parking fee. The Credit Valley Railway was built in 1879 to connect Toronto with Orangeville. A branch line was also built between Cataract and Elora but it was only operated under the original name for four years before it became part of the Ontario & Quebec Railway. In 1884 it was leased to the Canadian Pacific Railway where it became known as the Elora Subdivision. A hundred years later in 1988 it ceased to operate and the rails were removed. 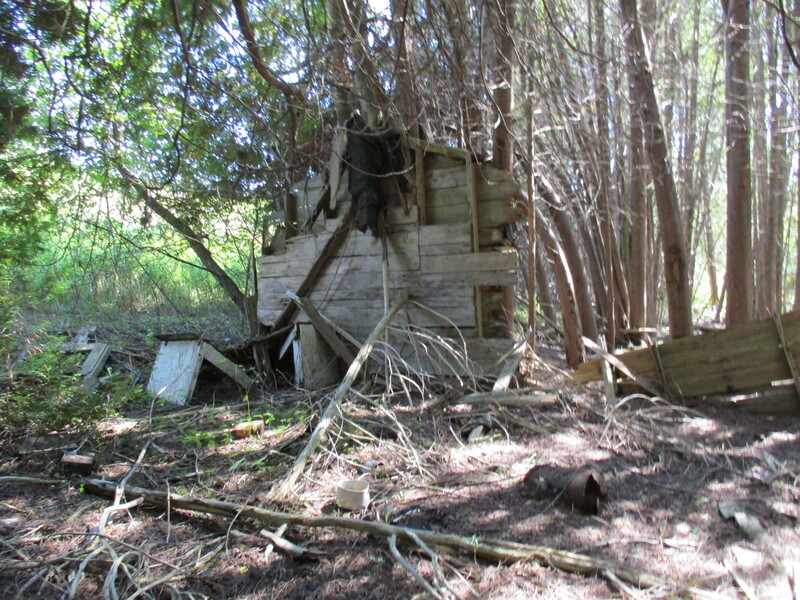 It only sat abandoned for five years before it was purchased by the Grand River and Credit Valley Conservation Authorities. 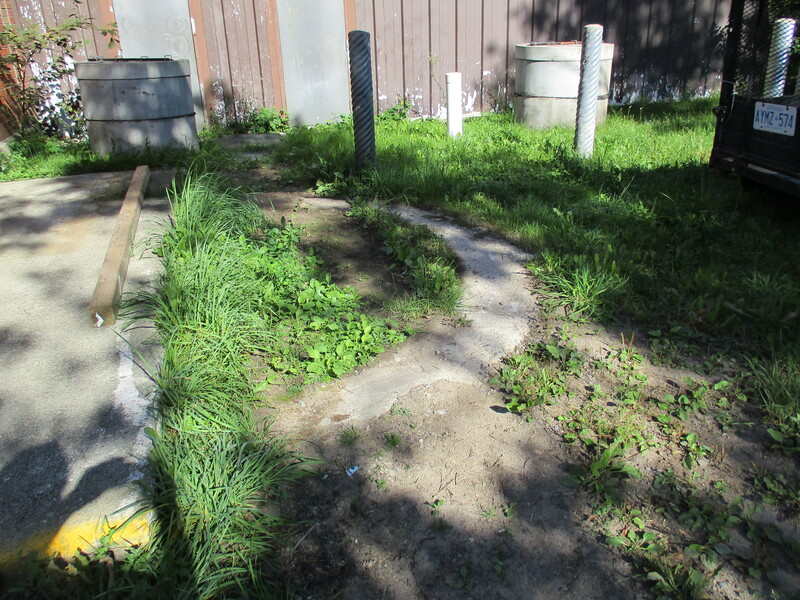 They have developed 47 kilometres of the right of way into the Elora Cataract Trailway. We parked the second car for free at the trail head on Station Road in Hillsburgh, the site of the former railway station in town. The Hillsburgh Pond was originally created to serve the two grist mills in town. The Caledon Mountain Trout Club bought the pond in 1902 and sold it to the Guelph Fishing Club in 1946. Today there is an ongoing debate about the future of the pond and dam as restoration is required and the pond may be drained instead. This old green shed, like the boathouse in front of it is collapsing into the pond. The property beside the train station used to have a set of ramps for loading livestock onto rail. A wind mill can be seen in the back of the old Awrey house which has recently been expanded to become the new library. Although we had chosen a stretch of trail that ran for 17.5 kilometres it was all pretty level as long as we were following the railway right of way. Only later when we got back to the Forks of the Credit Provincial Park and found an extensive set of stairs to climb did we realize that starting at Cataract would have allowed us to descend those stairs instead of climbing them at the end of the hike. The trail still had snow and ice on it where the hard packed trail was sheltered from a lot of direct sunlight. The red squirrel uses his tail for balance and to control his jumping. When they are upset or feel threatened they also use it for communication. When it gets cold and they need a blanket to snuggle up with they use their tails for this too. After leaving Hillsburgh the trail crosses a couple of side roads before coming to the town of Erin. The railway ran along the northern edge of town where the rail station used to stand. At Shaws Creek Road you come to the old Pinkney Farmhouse which was built in 1886. 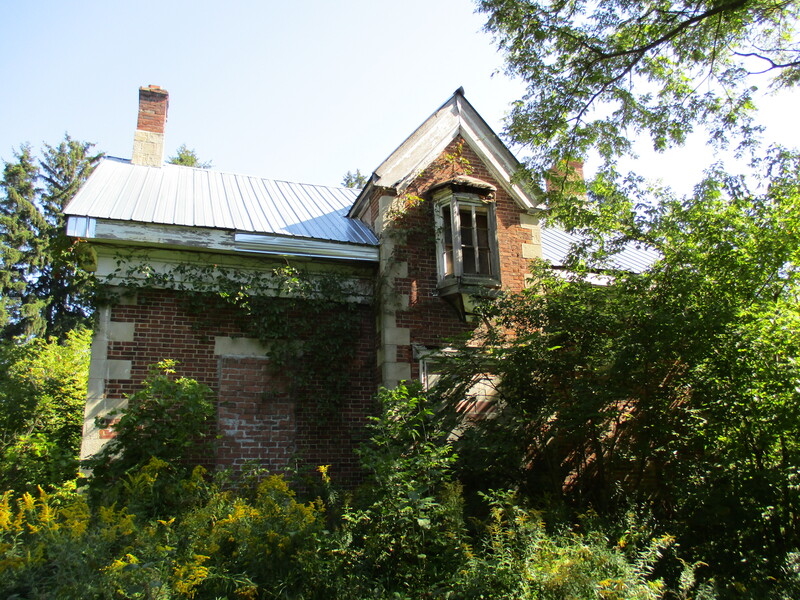 Fifteen acres of the Pinkney property was used for a large gravel pit and the current owners are Lafarge Canada who might be interested in restoring the house in exchange for increased quarry rights. The Pinkney barn was in poor shape and was demolished last year. The trees are growing back in so that in some places they may offer a little shade on the summer. When this was a active steam railway the trees would have been kept trimmed back for the full property width to help discourage fires caused by errant sparks. The trail ends at Cataract Road but we were still several kilometres from the car. Based on the signs at Mississauga Road you could park there and walk the short section to the end of the trail. This would be a lot shorter and considerably cheaper as well. The Credit Valley Railway line continued east to connect with the Orangeville line. Where it is not used as the trailway it isn’t maintained or improved but it is still quite passable. Two of our previous posts, Forks of the Credit Provincial Park and Cataract Electric Company, tell the history of the mills in the park. A few signs of the old railway still remain including old sleeper ties thrown along the sides of the trail to rot. For long sections of the trail some of these ties have been used for fence posts by the local farmers. Inside the Forks of the Credit Provincial Park an old telegraph pole still marks a bygone era. Coltsfoot looks similar to a dandelion but has no leaves at the time of the flowers. Once the flowers have faded the leaves will come out for the summer. Having covered about one third of the Elora Cataract Trailway we intend to return a couple more times to complete the trail in its entirety. This entry was posted in Elora Cataract Trailway and tagged Cataract, cataract electric company, Credit Valley Railroad, Elora Cataract Trailway, Erin, Hillsburgh on April 13, 2019 by hikingthegta. After having visited The Ghost Town Of Sixteen Hollow and Trout Hollow I wanted to complete the trilogy and visit the collapsed house in Hermit Hollow. I parked off of Station Road where the old Credit Valley Railway station once stood. I walked south on the old rail line then walked the length of the main street. After the coming of the railway potato growing became an important part of the Hillsburgh economy. In 1881 the first carload of 210 bags of potatoes was shipped from Hillsburgh to Toronto. Before long up to 3,000 bags a day were being shipped. For a few years the town even celebrated Potato Fest. The cover photo shows a plastic button from the 1973 festival. Beside the railway station stood large potato sorting and storage sheds. An underground potato storage facility near the railway station has been converted into a house. Note the concrete storage entrance on the side of the house and the extensive berm for storage. All of the windows have been reduced in height and bricked in and a doorway has been closed off where the propane storage tank stands. In 1821 William Howe bought lots 22 and 23 in the seventh concession of Erin township. 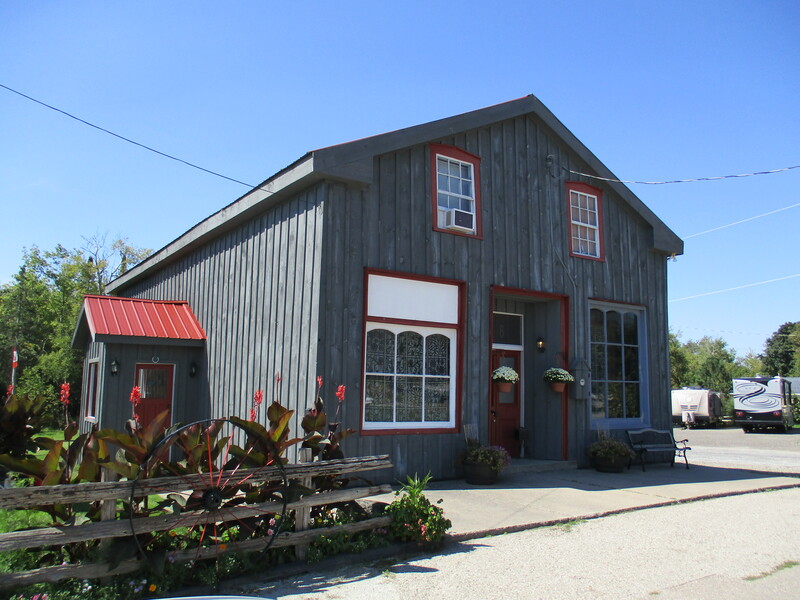 He built a general store and trading post on the 7th line. His second, larger store, blew up due to careless smoking and storage of gunpowder. A third store was then built which operated into the 1970’s. All of the old tin advertising for Coke, Black Cat Cigarettes and the Orange Crush door handle are all gone from the store front and now it survives as an office building. Nazareth Hill arrived a couple of years later and built a hotel on lot 25. He surveyed his property for town lots and named the community after himself. As Hillsburgh grew it swallowed Howville. It was incorporated as a police village in 1899 with a population of 500. The first school house dates to 1844 and survives today as a private residence. A one room brick school was completed in 1864 with an addition for the juniors on the front in 1878. 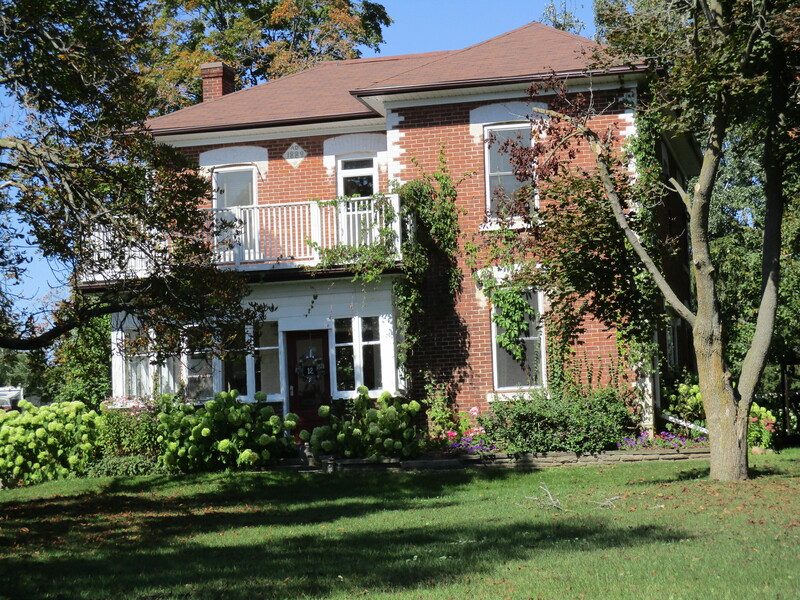 In 1960 six acres were purchased from the Nodwell farm and Ross R. McKay school was opened with four class rooms. The picture below shows the old school which has served local farmers as Hillsburgh Feed since 1963. The 1864 school room is hiding in the back beside the feed silos. William How is buried in the pioneer cemetery near the middle of town. After many years of neglect the stones were gathered up and placed in a central location. William Nodwell came to Canada from Ireland in 1838 and settled on Lot 24. His first log home burned down within a year. Nodwell then sold half of the lot and constructed another log house and barns. In 1868 the brick house shown below was built. This view shows the front of the now abandoned house with it’s second story oriel window. In 1895 the house at the corner of the lane was added for use by family members. In 1926 Mungo Nodwell took over running the farm which was well known for the potatoes he grew. Today there is an open proposal to develop this farm for a subdivision and the electric fence that used to surround the school yard has been replaced with a row of trees. A second town hall was built in 1887. The date stone is interesting because it has no “h” on the end of the town’s name. Notice the two maple leaves above the date and the beaver below. The Beaver was the name of the town newspaper in 1887 and cost 25 cents per year, paid in advance. Six of Hillsburgh’s seven church buildings remain. The first, and only missing, church was the Union Church and it stood beside the pioneer cemetery. As each of the denominations grew they left the Union Church and got their own buildings. From the south end of town is the Baptist Church (1862), Christian Church (1906) and St. Andrew’s Presbyterian (1869) which burned in 1965 and was rebuilt in the original walls. Beside the river stands the United Church which was reassembled here in 1926 and the Anglican Church seen below. It was built in the early 1890’s but closed in 1918 and served as a honey extracting plant after that. Hillsburgh didn’t have a fire hall until the church fire of 1965. After that it had a two door building that stood beside the river. When the arena was replaced it was moved to Station Road. Today there is a semi-circle of concrete on the ground behind the arena to mark the tower where the fire hoses were hung to dry. 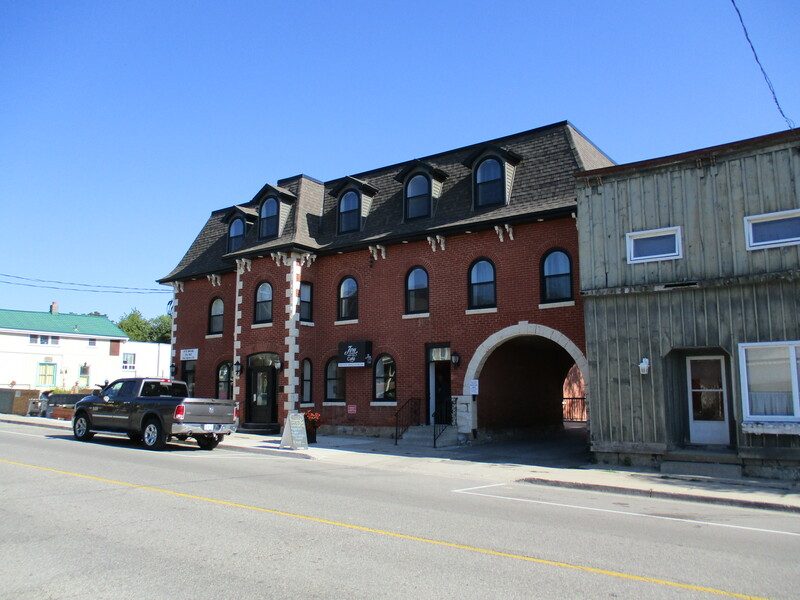 The Exchange Hotel was built in 1883 and was one of three hotel buildings that remain in town. Until recently It had stables in the back for the traveler’s horses and lettering on the arch which said “Good Stabling”. 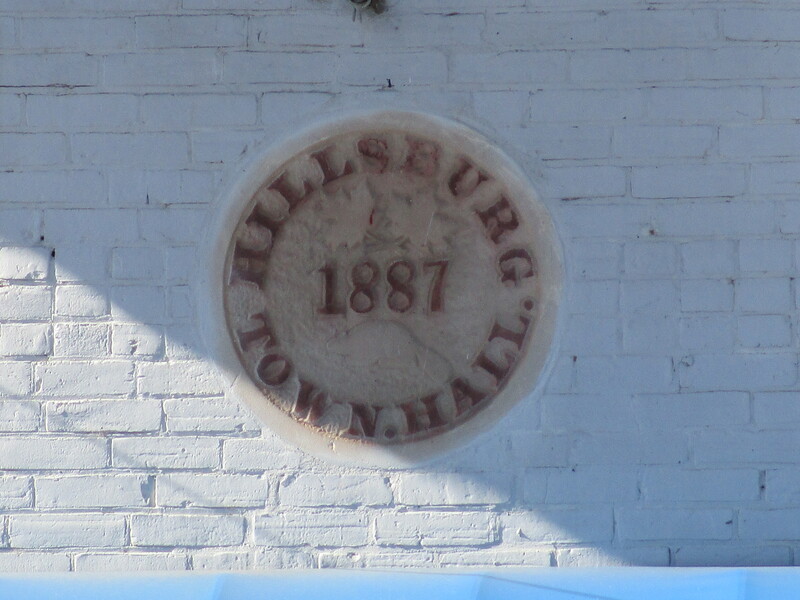 It is the only three story building in Hillsburgh. Church Street was home to the Methodist Church. This was also the site of the town’s third cemetery which lies below the lawn. 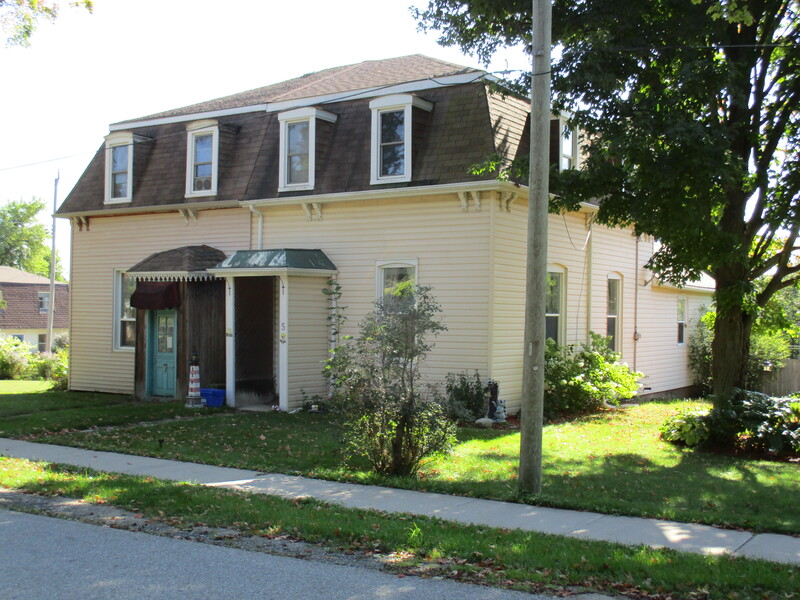 The Barbour house, dated 1889, is on Orangeville Street and is one of half a dozen houses in town which are dated in the 1880’s and 90’s on a diamond shape date stone. 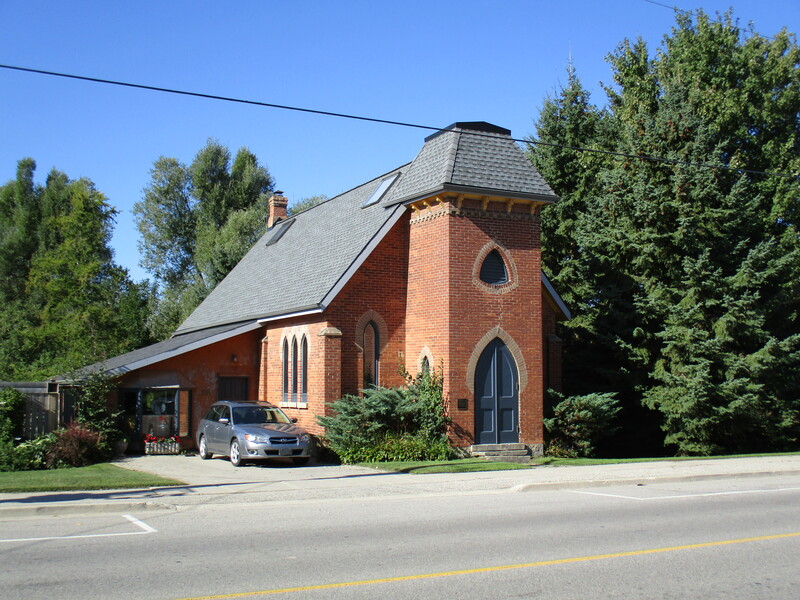 These were built by Alexander Hyndman whose own 1879 house stands beside the Christian Church. On the south east corner of the 8th line and 27th side road lies one of the headwaters of the Credit River. 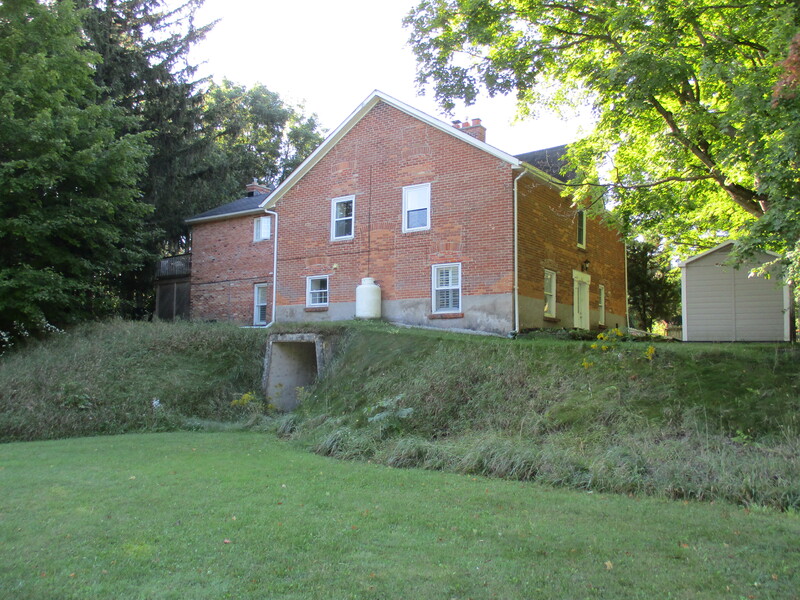 In 1906 this property belonged to the Caledon Trout Club and later was a fish hatchery. 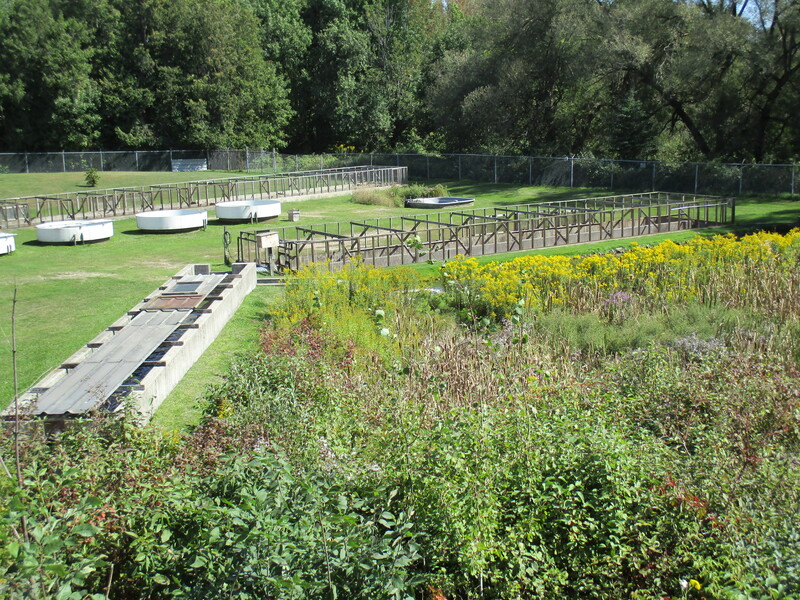 From here the water flows through Hillsburgh’s three existing ponds and into the Credit River. A little boat dropped in this trickle of water could eventually emerge in Lake Ontario at Port Credit beside the much larger ship The Ridgetown. Leaving town on the 7th line there are two large hills. In the hollow on lot 18 stood an old shack covered with asphalt siding. During the early 1970’s a hermit lived in this house. It was already in a state of decay at that time and collapsed by the middle of the decade. Today one wall remains leaning against a tree and the rest is in advanced decay on the ground. In good hermit fashion the property is strewn with old tin cans and empty bottles. 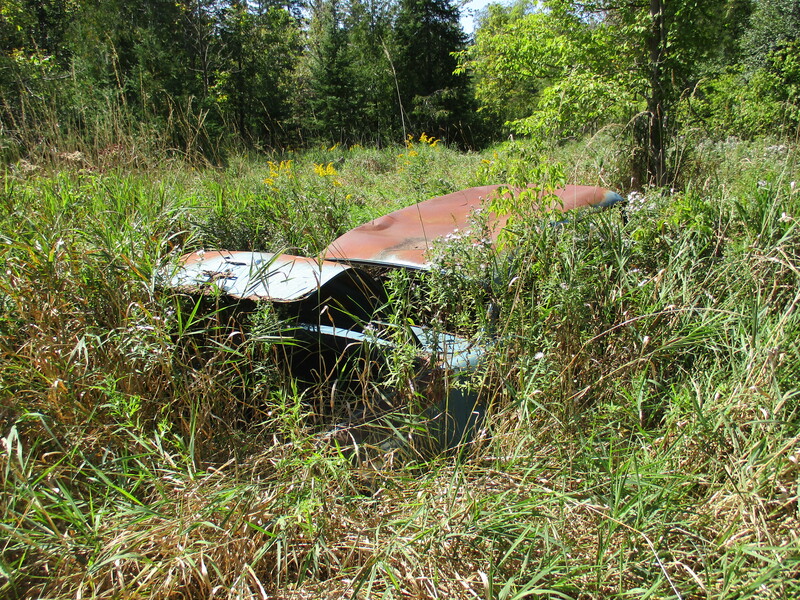 An old car from the 1940’s or early 1950’s lies rusting in the tall grass at the back of Hermit Hollow. 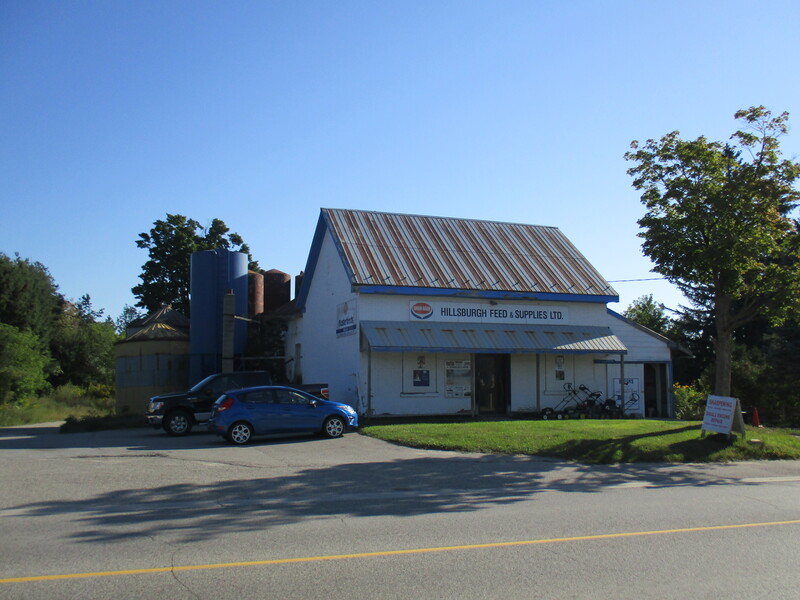 Hillsburgh retains many historical buildings and is an interesting time capsule of rural Ontario. 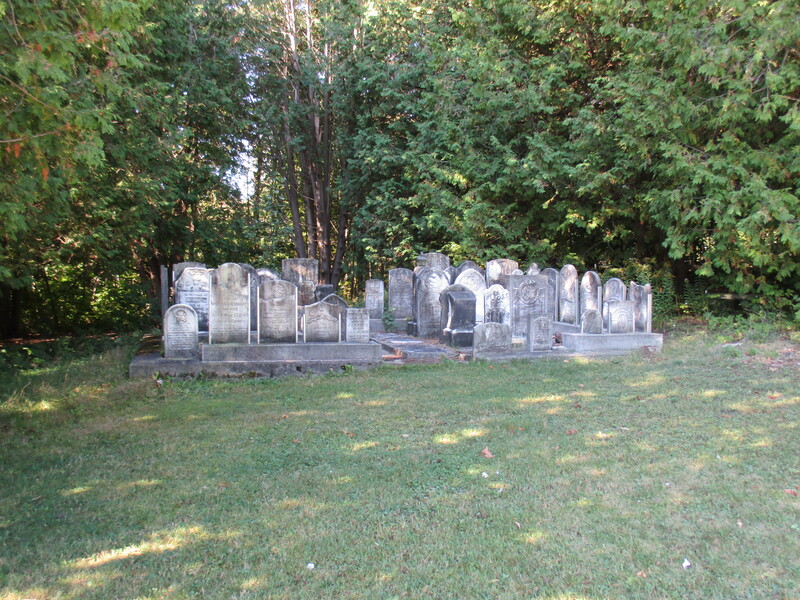 This entry was posted in Uncategorized and tagged Credit River, Gooderham & Worts, Hillsburgh, pioneer cemetery, Potato Fest on September 18, 2015 by hikingthegta.